Last week I had the opportunity to attend the IAGC conference. I don’t attend every year, but this year I went with a colleague because we both were presenting. For those that might not be aware, this conference is really geared towards gifted education in the state of Illinois. Administrators and teachers primarily attend this conference. It’s a multi-day conference that’s hosted in a Marriot in Naperville. I believe last year there was around 500 people (I’m estimating) attend – so it’s more of a smallish conference compared to some of the other education powerhouses in the the state. The freezing temperatures impacted attendance this year as driving conditions probably kept some away. Most of the attendees that I saw last week are teachers that work with students with exceptional needs. Many of the teachers created sub plans and then school ended up being canceled because of the cold weather. Go figure. Whenever I’m asked to be out of the classroom for a meeting, conference, workshop, etc … I always am wondering if it’s truly worth the sub plans – kinda joking here. What I enjoyed more particularly about this conference was that some of the presenters were teachers. Certainly not all, but there were a few sessions that I attended that involved teachers presenting to an audience. Some of the themes were related to acceleration, leadership, curriculum, social-emotional and equity with identification. I attended on Thursday and was able to attend a couple sessions – mostly related to curriculum and differentiation. There’s a practicality component that is involved when a teacher is having a conversation with another educator. Most of the sessions were small enough that you could engage with the presenter by just raising your voice. Love that. I find it similar to an edcamp experience as individuals have a similar understanding of what’s expected in schools. There’s a large difference (at least from what I see) between teachers currently in the classroom and those that aren’t. Now onto the sessions … I attended a session related to using adapted software in the classroom. Hearing positive ideas about how to use these in the classroom was different since I’m usually not too fond of this type of learning. The presenter gave a brief overview of a couple paid/free adaptive programs and spent a good amount of time answering questions about how to use them in the classroom. Another session emphasized the use of Jacob’s Ladder scaffolding techniques. The questions from the participants spurred additional questions – love when that happens. Later in the day Cheryl and I presented on using math routines in the classroom. Participants that attended offered their own ideas on routines that they found helpful. It was truly an engaging experience to hear how others use and differentiate math routines. It was also refreshing to connect with other educators outside of our local area about how to create more meaningful math experiences for students. I think teachers need to explore outside of their district boundaries from time to time. Discussing some of the routines afterwards was also encouraging. All in all, it was decent conference and worth the sub plans. I left with a better understanding of how certain tools and strategies can help meet the needs of exceptional students. I’m looking forward to the conference next year. One goal this year is to have my classes complete more interdiciplinary projects. These projects move beyond district-adopted texts and often involve multiple subjects and student groups. I find value in having these projects as students often need to work in teams and apply their mathematical thinking in different situations. Back in September I came across the tag #paperrollercoaster. After completing a quick search I came across multiple pages where teachers had students create paper roller coasters and answer questions. The questions were often related to math/Science objectives. I thought this had potential so I finalized a decision and ordered a set from here. My thinking was that if one worked out well I might order more. The materials arrive around a week after I placed the order. I decided to use the project with a third grade class. After a brief explanation, students were placed in three groups. One group drew out and created an outline for the base on a piece of cardboard. The group was asked to create six square bases where students would be placing support columns. The second group scored, cut out and attached the base columns together to be placed on the outline of the first group. The third group was in charge of creating the support beams. Students scored, cut out and opened up both ends of the beams so they could be added to the columns. All groups had approximately 20 minute to work in their group. They were supplied with tape, scissors and directions. Afterwards, the class met in the front of the room and we started to build the base for the roller coaster. During that time the class started to discuss some of the math vocabulary we’ll be using as the building continues. Most of the terms will be coming from the geometry and measurement math strands. The terms area, surface area, volume, length, formulas, speed and height were all discussed before the students left for their next class. I appreciate the multiple math entry points available through the use of this project. As the project progresses I’m planning to add activities/sheets that we use. In the meantime, feel free to check out a few lessons here. I’m always on the lookout for classroom furniture. The reason comes from a belief that classrooms should be setup in a way to allow students to work together. Having classroom furniture gives students places to work in the classroom. That collaboration can take on many different forms, but having set spots in my room helps organize the process. Opportunities to share ideas, debate, work though problems and come to some type of consensus often exists when students are given time to work together. Talking through their math processes can help students practice their math communication skills. During that process students have to validate their mathematical thinking, especially if there’s some type of disagreement between peers. Teachers use many different methods to create student groups. I still use the generic popsicle stick method to choose groups. Lately, I’ve been using Michael’s super grouper 3.2 spreadsheet. This has saved me so much time in organizing my student groups for stations. Many functions are available within the spreadsheet and I have only explored some of the features. Feel free to download Michael’s amazing creation here. Once students see their group on the whiteboard they head towards their specific station for the day. I then turn on my timer and students work. Sometimes the stations are used for individual journal writing and other times they’re used as an area for students to utilize math manipulatives. All of my math stations are setup around the perimeter of the room. Each station has a name so it’s easy to assign particular places in the room. I decided to go with a coffee theme for my stations. I put a logo on each table to make them easier to identify. Click on an image below to see the station in more detail. I periodically check in with each group to ask questions and observe math understanding. I jot down notes, take pictures or record math conversations that can be used later. When the timer goes off all groups go back to their seat and the class debriefs. So far this system seems to be working well. I’m looking forward to using these types of stations throughout the year. The topic of mathematical rates was introduced earlier this week. Personally, I tend to find this unit enjoyable as there are many opportunities to connect the topic outside of the classroom. To introduce the topic my classes go home and find examples of rates in their kitchen’s pantry. The next day the class shares out what they found. This usually leads to an in-depth conversation about rates and patterns. After our conversation I felt as though more examples and experiences were needed. When the students walked into the room they were surprised. A few started to jog around the track and ask questions about the room. Already I was fairly excited as the students were pumped to see what I was up to. I explained to the students that we were going to use the track to discuss rates, patterns and measurement. The class then measured out the track and found that it was 66 feet long. We had a conversation about how this track could be used to emphasize rates. I then introduced the students to the sheet below. Students were starting to see the big picture of this activity. Students then took turns and quickly walked the course. While they walked I had a few students become referees to make sure that no one stepped outside of the path. I used an online counter and displayed the results as students quickly walked. Once all the students completed their route and wrote down their results the class reviewed how patterns can be developed with rates. Students were able to find the amount of feet traveled per second and then used that information to find how fast they walk one foot. I was finding that students were trying out different mathematical strategies to find a solution. I gave them opportunities to work with each other to find solutions. I asked clarifying questions when needed, but for the most part the students were on track. When the class finished this part of the sheet I gave them the second part. This portion of the activity was more challenging. Students were able to find the total amount of seconds, but converting the seconds to minutes was a struggle. Many students asked how they could convert 12.9 minutes to minutes and seconds. I was proud to see that students understood that 0.9 doesn’t mean 9 or 90 seconds. This was a great opportunity to explore the concept of converting decimals to actual minutes. The class used different calculations and found that 12.5 would actually be 12 minutes and 30 seconds. As progress was made students started to find a conversion strategy to correctly convert the decimal to seconds. As a class we shared our results and found patterns and the mean. This activity worked so well that I used it with a few other classes this week. I’m finding that students are developing a better conceptual understanding of rates while participating in a learning experience that I hope they don’t forget too quickly. How do you introduce rates in the classroom? My fourth grade class is now studying geometry. Geometry at the elementary level allows opportunities for students to get out of their seats and learn while using their compass and protractor. 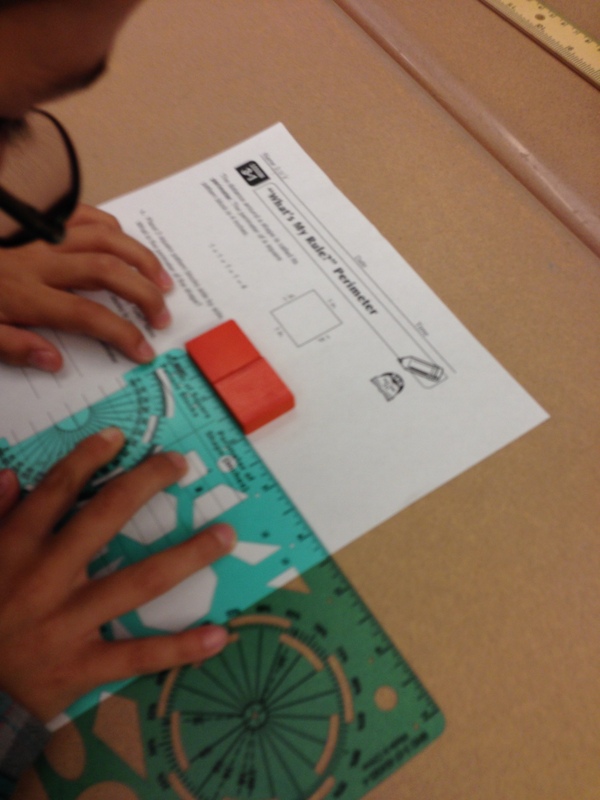 Last week my students dusted off their protractor and compass in preparation for the geometry unit. Throughout the years I’ve added different geometry explorations to this unit. Some of the activities in this post have been modified from the curriculum and others I’ve created or borrowed from some amazing teachers. I’m going to highlight four specific geometry explorations that I find valuable. Students are given different types of polygons and asked to find interior angle measurements. I tend to group the students and have them work collaboratively to find a solution. Students can use any method to find a solution. I find that some groups use a protractor, while others find the measurement of the triangle and use it to find the interior angles of other regular polygons. Near the end of the session the class creates an anchor chart that shows similarities/differences between the polygon shapes and their sum of measures. I pass out a notecard/piece of paper to each student. 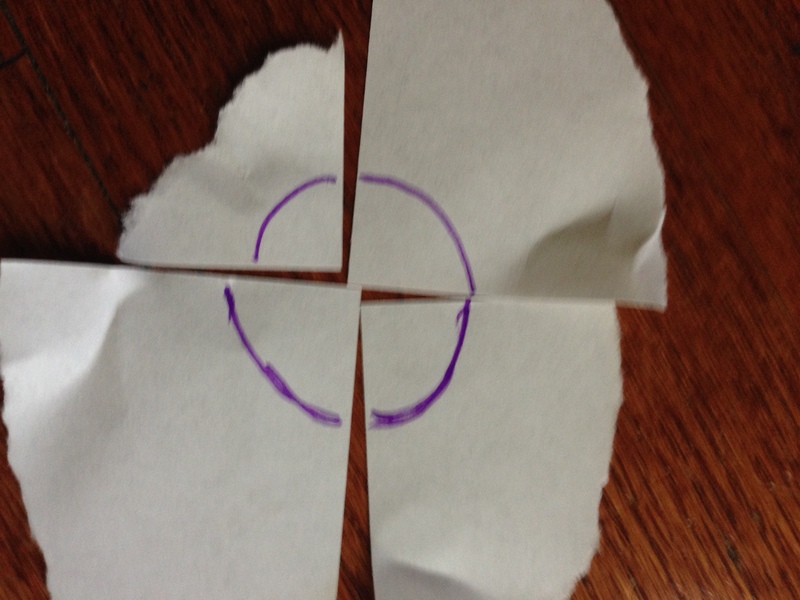 Students are asked to make an arc on each corner of the sheet. The arcs don’t have to be the same size. The arcs are cut out and put together to form a circle. Essentially, students use a rectangle and turn the rectangle into a circle and both have the same interior angle measurements. Students are then asked what conclusions can be made by completing this activity. I generally use this activity before teaching about adjacent and vertical angles. 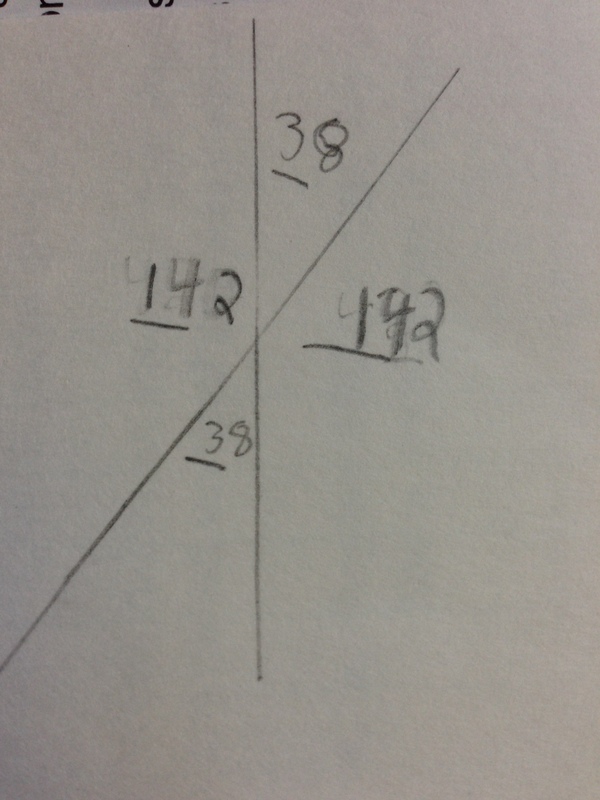 Students are asked to draw and label two intersecting lines. This should be review, but most students haven’t been using angles in math class for about eight months. Once the angles have been created, students measure each angle. Students are then asked what they notice about the measures of the angles? Do they notice any similarities? This is a great opportunity to fill out an anchor chart indicating what angles are close in measurement. Students are asked to find and explain the reasoning for the measurement of angle Z. Overall, these exploration activities allow opportunities for students to engage in math in unique ways. Math manipulative and explorations often open doors that ignite interest in many students. When I first introduced the problem the students had a million questions. The questions were mostly related to what operations to use and hoping that I’d give away a few hints. I want the students to succeed, but I also want them to become more responsible for their own learning. I answered the questions related to the directions, but intentionally didn’t give away any information regarding what procedures/operations to use. The students were then divided into groups and given 20 minutes to find a solution and present the answers to the class. The next 10 minutes or so were challenging. Challenging may be an understatement. The students struggled, period. They had a tough time knowing where to start after finding how many dollars fit in a ream. The less I spoke the more the students seemed to flounder. Students began to look at each other and within to find a solution. After the initial 10 minutes, the groups began to click. Students started to find that their solutions were working. The students were beginning to make progress. The students were pumped and I tried to hide my own excitement for them as some groups were still struggling. Groups were gaining momentum and near the 20 minute mark most groups were finished or partially finished. The students then presented their journey in problem solving and the process used to find the solution. Each group solved the problem (or came close to solving the problem) in a different way, but all the groups learned from each other during the presentations. Following the presentations, the class had a discussion related to the math prompt. The groups reflected on how challenging it was to persevere through the struggle of not knowing how to solve a problem. I’m glad that the students were able to experience the struggle. Moreover, I’m glad that some of the students were able to use math problem solving strategies and look within and to each other to persist. This week I introduced function machines to one of my primary classes. The activity yesterday revolved around the concept of number patterns and perimeter. Student groups were given a pile of square geometry blocks. The groups were asked to find the perimeter of one square. The perimeter was quickly found, which ended up being four inches. 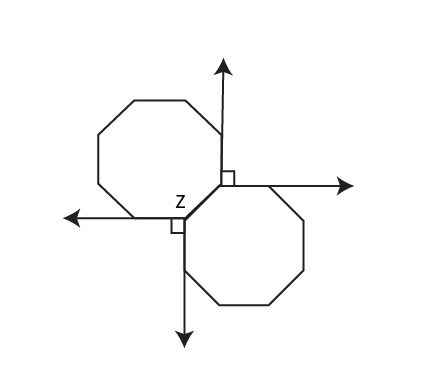 Students then found the perimeter of two squares connected. Students started to recognize a pattern as they filled out their in/out table. Students were then asked to explain a rule for finding the perimeter of the square shapes. Many of the student groups attempted to find a rule, but found a single digit addition or multiplication rule that didn’t work for all the numbers. The groups started to struggle in an attempt to find the rule. One group finally came up with a rule indicating (in x 2 )+ 1 = out. Students were excited that they were on the right track. After a few minutes another group came up with a different answer (in + 1) x 2 = out. A couple of the groups asked how can there be more than one rule? This allowed an opportunity to have a conversation about equivalent rules. After students found the rule(s), they were asked to find the perimeter of 423 blocks. I told the student groups that I didn’t have 423 blocks, so they will need to use a rule to figure this out. Students began to understand the usefulness of math rules. Even more, I was glad that they were able to explore the advantages of having math rules on their own.